What do you get when you put ten former Apple engineers together in one kitchen? 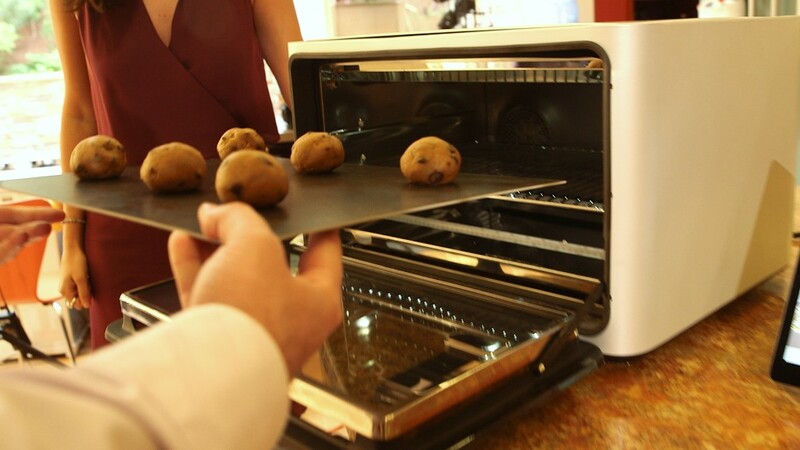 An oven equipped with an iPhone-like interface and built-in camera to help you "optimize" your cooking. Co-founders Matt Van Horn and Nikhil Bhogal created June, a computerized oven that "thinks" like a chef. The oven, which costs $1,495, uses sensors to recognize the type of food you're cooking and instruct you on how to cook it best. You don't have to preheat the oven, and, best of all, the smartphone app sends you a notification when the food is ready. A year and a half ago, Van Horn and Bhogal left their jobs at social networking startup Path and started working on the concept. June officially launched a month ago, although the product won't ship until next year. "It has the guts of a phone or a high-end tablet," said Bhogal, who worked as an engineer on Apple's (AAPL) first generation iPhone. "Essentially, it's a computer that cooks." The infused the oven with Apple's design ethos as well. Van Horn and Bhogal hired Robert Brunner to design the oven. Brunner was responsible for the design of Apple's PowerBook. He has since created his own design firm Ammunition, which is behind well-known products like Beats by Dre, Square and Polaroid redesign. "We wanted to make a beautiful oven so we looked at every surface, every detail, every bit of functionality," Brunner said. June isn't meant to replace the oven -- it sits on the countertop -- and isn't equipped to cook larger meals. Van Horn, who was part of the founding teams at Path and Digg, says it's the offline world that most excites him these days. As mobile phones get cheaper and add processing power, there are going to be sensors everywhere -- which creates new frontiers for innovation. "As entrepreneurs, we're able to take advantage of the supply chain and put a 2.3 gigahertz processor in our oven," he says. "I think cameras and sensors plus intelligence is a really interesting trend." June now has 23 employees who work out of a home in one of San Francisco's wealthiest neighborhoods. And while Silicon Valley companies are known for their perks, June employees enjoy a unique advantage: a large kitchen equipped with everything from chocolate chip cookie ingredients to steaks that are constantly used for beta testing June's intelligence.